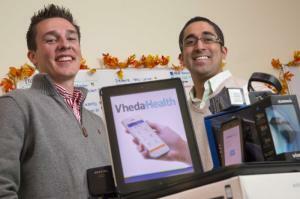 Click to listen to Vheda Health, awarded as Best Start-up in Maryland 2014 and Healthcare Technology Company of the Year on the December 30th, 2014 AHA BUSINESS RADIO SHOW broadcast. Founders, Shameet Luhar and Philip Rub, started Vheda Health as a way to empower individuals everywhere by delivering easy affordable access to personalized care. Don’t miss next weeks show at 6 pm on 1300 WJZ-AM!